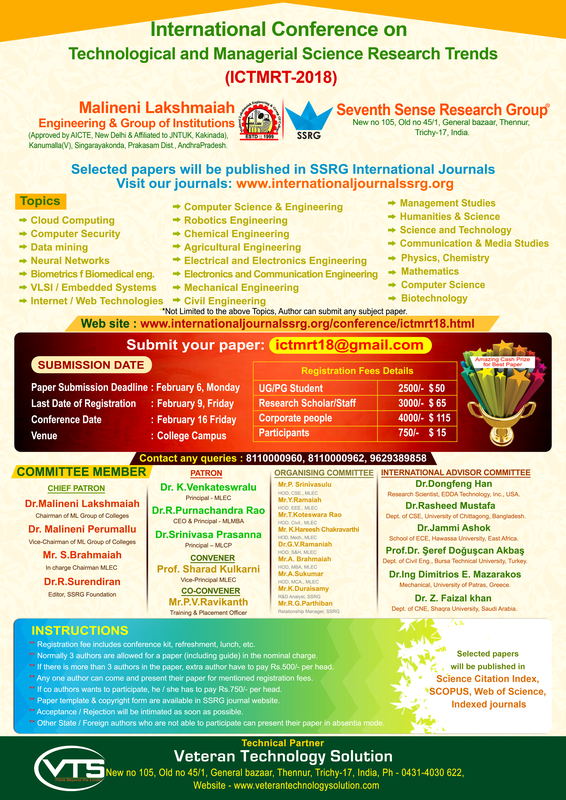 International Conference on Technological and Managerial Science Research Trends (ICTMRT-2018), Malineni Lakshmaiah Engineering & Group of Institutions, AndhraPradesh, India. The aim of ICTMRT-2018 is to bring all the research domains together on a single platform. This conference will bring the research communities of different fields together at one place to share their researches and ideas. Also the purpose of this conference is to implement the researches of one field into another to bring out the best applications of these researches. ** If co authors wants to participate, he / she has to pay Rs.750/- per head. ** Other State / Foreign authors who are not able participate can present their paper in absentia mode. 200 years ago, at the time of erection of “Dwajastambam” in Varaha Narasimha Swamy temple, a saint installed Prasannajaneya swamy statue. Here, in 1918 a bridge was constructed over ‘Bhasanti’ river. The grand Brahmotsavalu celebrations held in June every year attracts a large number of devotees. Located 16 kms from Bapatla and 60 kms from Ongole, Chirala is well known for its textile. Bed spreads, curtains, tapestry fabrics and sarees are popular offerings of the place. It’s also popularly known as Mini Bombay. Motupalli is located 12 km from Chirala and 45 km from Ongole. An ancient seaport, Motupalli flourished under various dynasties from the 1st century A.D. onwards. It is also the site of Buddhist stupas and sculptures. An ancient temple of Sri Rama is also situated here. Located at 75 km from Ongole, a major Buddhist site has been excavated here on a hillock known locally as Singarakonda, beside the Gundlakamma rivulet. A unique double terraced stupa on the hilltop, perhaps the only one of its kind in South India, is reminiscent of the famous Dharajaka stupa. A museum at the site houses important sculptures and other relics such as coins, black and red ware and inscriptions in the Brahmi script dating back to the 2nd century B.C. Located at 40 km from Markapur and 93 km from Ongole, it’s a well known place of pilgrimage. This is the site of the Tripuranta Keswara Swamy temple situated on a hilltop. The main idol is in the form of a linga with 5 faces, including the image of Ganga Bhavani. According to mythology, Agasthya Maharaj built a cave here that leads to Srisailam, Rameswaram and Kashi. Located at 94 km from Ongole, and situated on the banks of the Gundlakamma river, this bustling town caters to 80% of the country’s demand for slates and slate pencils. It is also a popular pilgrim destination because of the Sri Lakshmi Chennakesava Swamy temple, built by the Vijayanagar rulers between 1405-1459 A.D. Apart from magnificently sculptured gopurams, the temple has a beautiful 40-pillared Mandapam with carvings of Krishna, Anjaneya, Garuda, Lakshmi & Vigneswara with their respective vahanas. In the Kalayana Mandapam there are 6 musical pillars that produce the 7 musical notes when tapped. Located at 6 km from Chirala & 35 km from Guntur, with a charming and scenic beach, it is a popular weekend get away for those wanting a break from the mundane city life. A great escape to the golden sands and sparkling waters. Yet another interesting beach is Ramapuram located 6 km from Vodarevu Beach. Private accommodation is available. Located 64 km from Kanigiri & 150 km from Ongole, the remains of several rock-cut temples dedicated to Shiva and other Hindu deities, dating back to the 7th & 8th centuries A.D., can be seen here. The shrines have lingas and small images of Shiva as well as other Gods. The architectural style is similar to that of the Pallavas, which flourished further south in Tamil Nadu. The beach is located 25 km away from Ongole. During Karthika Powrnami thousands of people visit the beach to take a holy dip. APSRTC has regular buses from Ongole to the Beach.